Best practices for predicting how a device will operate over time—and what to watch out for. Aging of electronics is not a new problem. In fact, analog and automotive designers have been analyzing aging for years. But it’s becoming an issue today for many different reasons. Device aging refers to the degradation of the device performance over time. Transistor performance degrades over time mainly due to degradation of the gate dielectric and degradation in the interface between the gate dielectric and silicon. For device aging, there are two mechanisms. One is called hot carrier injection (HCI), which occurs when the device is biased. There is an electric field and carriers are supposed to move between the drain and the source, but some of those carriers bombard the gate. Over time the carriers injected into the gate start to change the electrical properties of the gate dielectric, and as they do that the threshold voltage of the transistor changes and the transistor simply doesn’t behave as it’s supposed to. The second mechanism that causes aging is called the bias temperature instability (BTI), which happens when there is a constant bias on the device meaning there is current flowing. Here, instead of being driven by electric field, it is driven here by bias and temperature. Also, charges start to get trapped into the gate and as this happens, the properties of the gate change and again it impacts the threshold voltage and the carrier mobility in that channel. “If you change the threshold voltage and if you change the mobility, then you have a different transistor,” he asserted. Device size and electrical field play a role in why aging is an increasing concern. The other aspect on aging is temperature. The bias temperature instability is proportional to the device operating temperature and a smaller device means it will heat up faster than a larger device. There are many internal and commercial approaches to prevent aging problems or perform aging analysis. One approach, as in the case of Synopsys, first simulates the circuit with fresh transistors to determine the stimulus of every transistor, i.e., how every transistor is biased during the operation of the circuits. This information is applied to an aging model of the transistor and based on that how the threshold voltage of every transistor in the circuit will change is calculated, how the mobility of every transistor and the circuit will change based on the aging model that the foundry will provide, plus the dynamic information about how every device is biased during the operation of the circuit. From that a new device model is created, called the aged device model, against which the circuits are run to see how the circuit will operate with aging and compare the fresh behavior with the aged behavior. Another approach is ‘protect and prevent.’ Matthew Hogan, product marketing manager at Mentor Graphics, said that from a SPICE simulation perspective, existing tools allow engineering teams to run simulation on the devices and attach aging models—similar to the Synopsys approach above. However, the company also looks at the issue from a full chip verification perspective, because when using aging simulations it is easy to get into a situation where there is limited capacity to run the tools. One way to do this is with ‘voltage propagation,’ which allows the engineer to holistically have a look at the entire chip by propagating these voltages and consider either the device is an ideal switch, so there is no voltage drop across it. Or it can consider both the forward and reverse bias voltage drops to give a more accurate and realistic idea of what voltages are going to be presented to each of these devices. “That’s really how we try and encourage people to be more proactive about avoiding these sorts of situations. Instead of trying simulate the artifacts of what you are left with in the design, let’s be proactive and validate and verify that the design that you are putting in place is actually going to meet those reliability criteria because the reliability guys have told you the thresholds that you need to adhere yourself to,” Hogan added. An important part of this is the product/process qualification, which is performed to fully understand the reliability of the wafer fabrication, package assembly and device design. Tests are performed to determine the robustness of the combinations of manufacturing processes, product and design, as well as to emulate the device under stress over a period of time. Upon completion of these tests, predictions can be made about how well a device will perform as it is aged in a system or application environment. 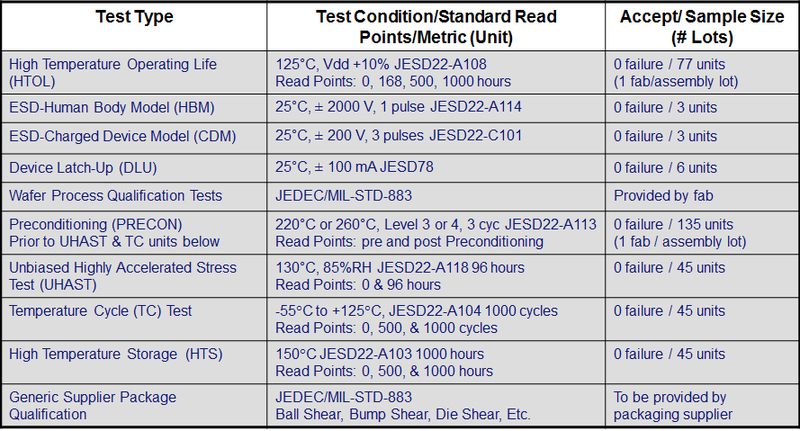 As seen in the table below, examples of these tests are High Temperature Operating Life, ESD, Latch Up, Temperature Cycling, Highly Accelerated Stress Test and many other tests depending on the end application market. 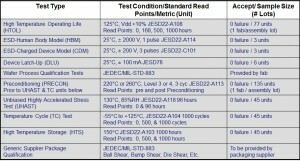 Conditions are set during these tests to best duplicate the stress a device will endure during the application operation and life expectancy predictions are made based on the ability to meet such testing conditions. Today, aging is done at the transistor level, but in order to be able to simulate the big systems, it has to be able to happen at the gate level. Synopsys’ Elhak noted that there are engineering teams who have done aging at the gate level by running millions of transistor level simulations on parallel machines. In one experiment, 100 CPUs were used and it ran for two or three days.